I left you kinda hanging with the last post.... 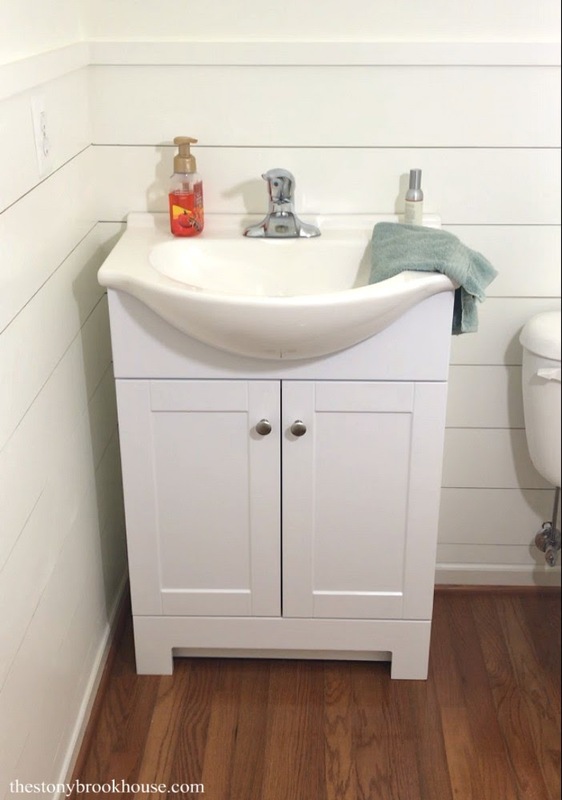 I had finished the side walls of shiplap but when I came around to that back wall, I decided I had had it with that pedestal sink! 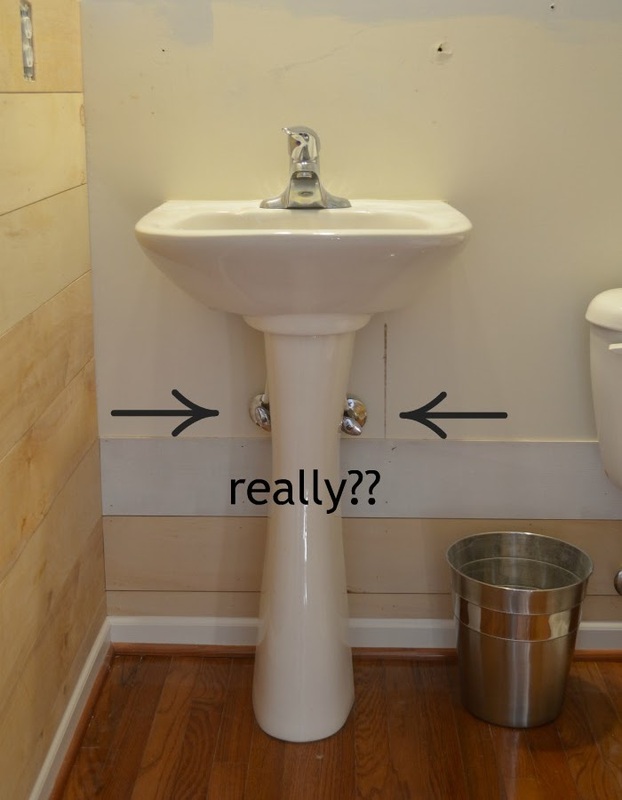 I mean seriously, don't you think the builder's could have done a better job hiding the plumbing??? 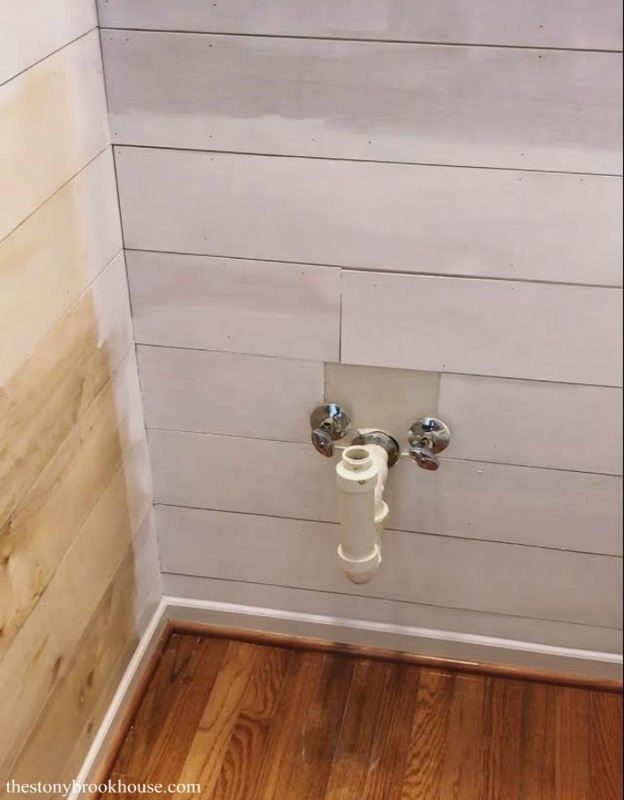 This makes me think that my slip is showing or something... You aren't supposed to see the plumbing. 🙄 Soooo.... I decided to rip it out. I had NO idea what I was doing. But I was just going to push through! I knew the first thing I needed to do was turn off the water! Then to disconnect the water lines. I learned that much from when I changed out our kitchen sink! 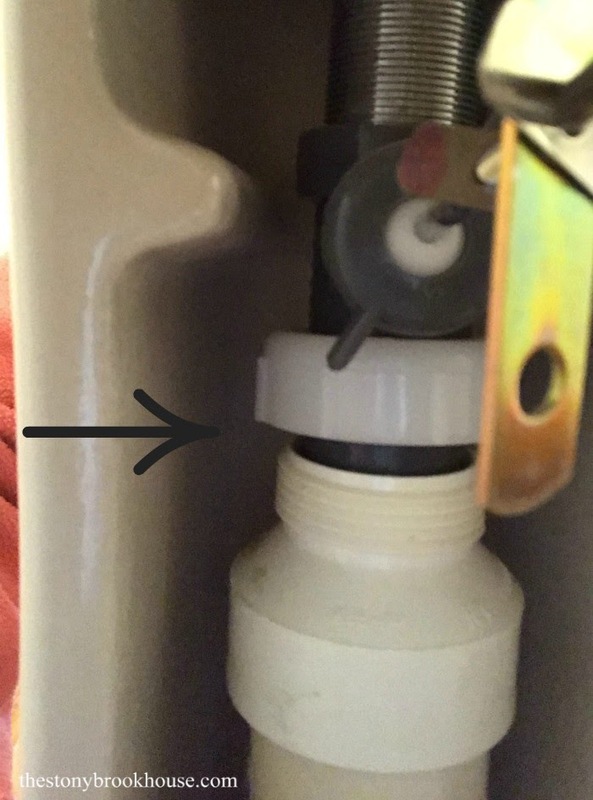 Once the lines were disconnected, I needed to detach the drain part. Hmmmm, that had me stumped and I was going to disconnect at the trap area. But before I got too far into it, I decided to give hubby a quick call. I'm so glad I did! 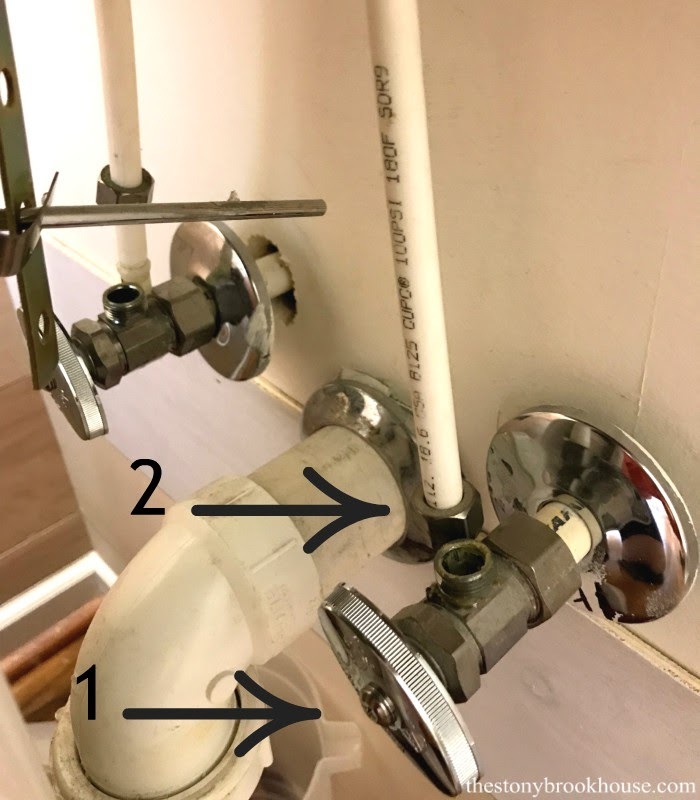 He told me there should be a straight pipe coming down from the sink that I could easily disconnect. Oh! I saw it! It was waaayyy in there behind the pedestal. Got it! Now, to figure out how in the world this sink is attached to the wall?? There weren't any screws... hmmm, so I started working at the caulking line trying to separate it with a spatula and a hammer. That seemed to be working. Next, I got to work shiplapping the rest of the wall. 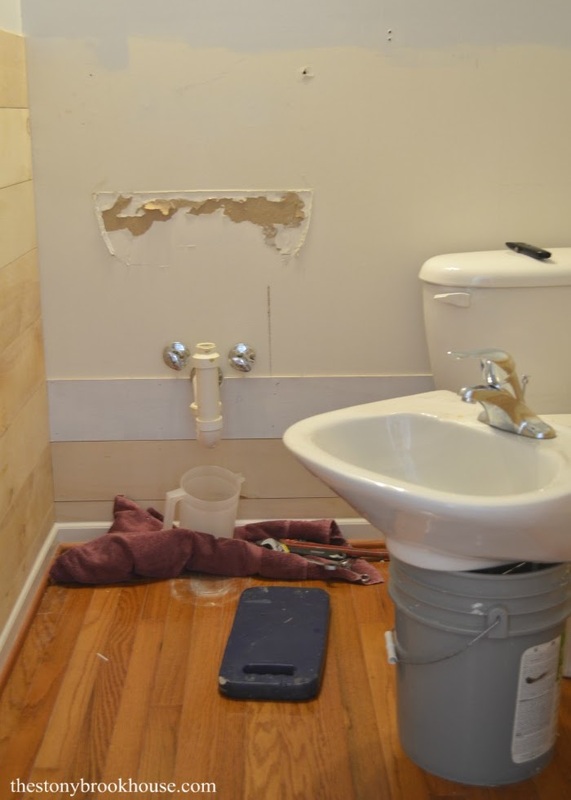 I wasn't too worried about perfection there, considering a new sink and vanity would be covering that area. 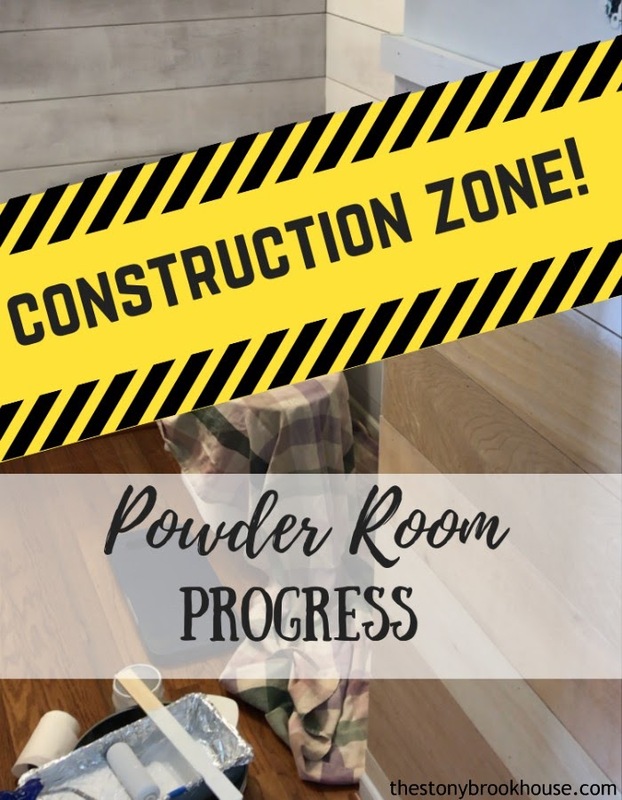 This little powder room is starting to shape up! I primed all of the shiplap before I filled all of the nail holes. It's soooo much easier to fill the holes after, because you can see them so much easier! Then filling all those tiny little holes and caulking the trim... finally it was time for paint! At first, I painted it with Home Depot's Behr paint mixed to Benjamin Moore's Simply White color in a matte finish. 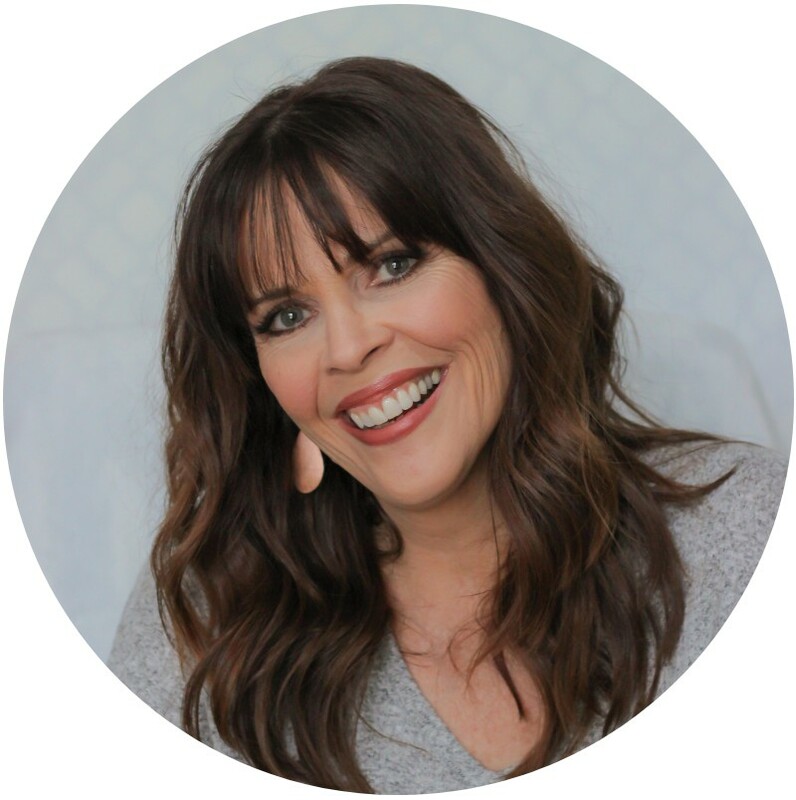 I used that same paint on the shiplap accent wall in our bedroom. Well, the matte finish seems to get marked up a bit too easily, so I went and picked up a can of the same color in a satin finish. Sooo much better. A couple of coats later and I was ready to stencil the upper part of the wall! Yay! I was so excited about this part! 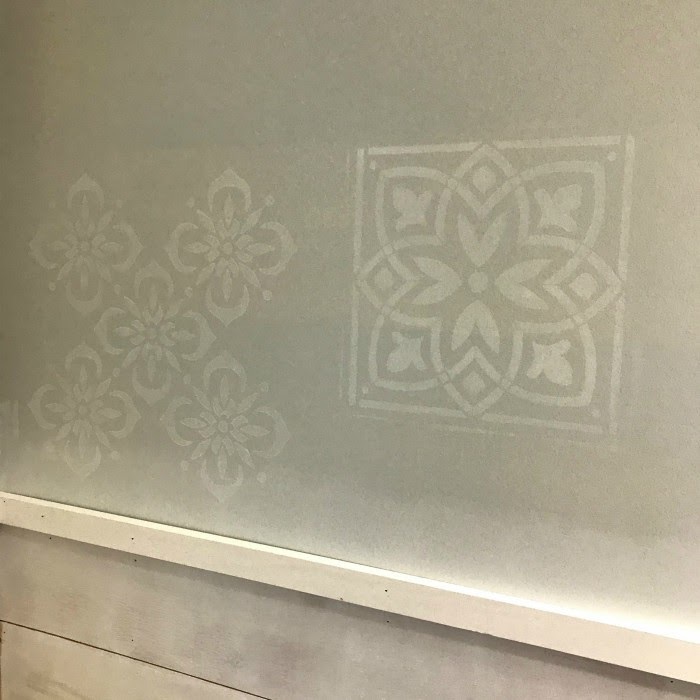 Well, I had 2 stencils that I picked up and I wasn't sure which one to use. So, I snapped these pics and sent them out to get some opinions... Don't mind the wall color and the fact that the shiplap wasn't painted yet... I was doing so many things at once!! 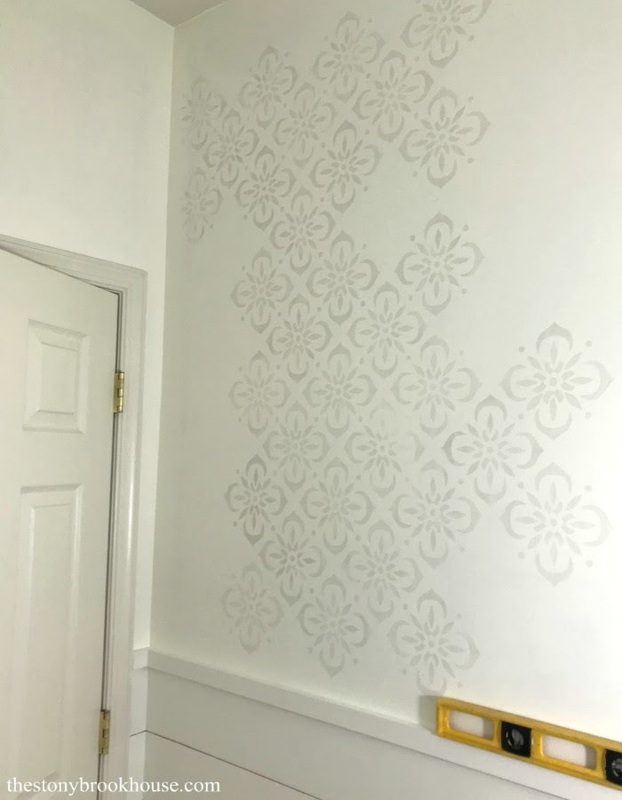 My daughter made the suggestion that I paint the walls white and do a creamy stencil. That sounded lovely! I ended up doing a gray stencil. The creamy looked more yellowy. But I'm so glad I went with her suggestion!! Doesn't it look pretty??? I told my friends while I was stenciling (It took 3 solid days!!!!!) 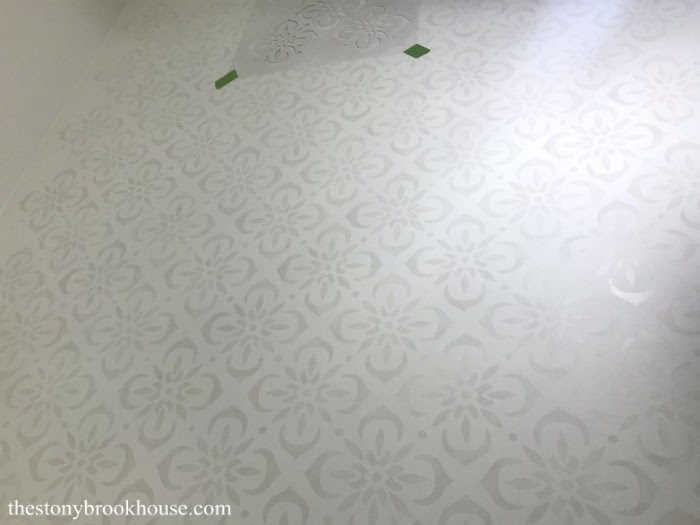 to NEVER let me stencil an entire room again. A wall wouldn't be bad, but doing corners and all that business was trying my patience to the limit! Ugh! Soooo glad that was done! There are plenty of imperfections, but for the most part no one will notice. Next up.... mirror, shelves, rug and art!